Northampton Township Lions Club - Times Publishing Newspapers, Inc. 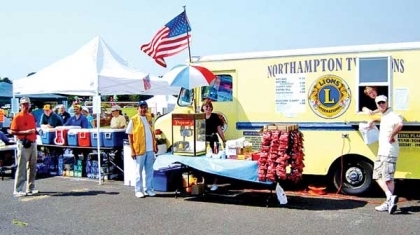 The Northampton Township Lions Club is a volunteer association comprised of your neighbors who have joined together to provide service to various communities in the area with emphasis on the sight and hearing impaired. They are part of Lions International ­ the world’s largest service club ­with affiliates circling the globe. The Lions have co­sponsored the popular summer concerts put on by Northampton Township Parks & Recreation. They also support the annual Northampton Days Festival held at the Richboro Middle School, the Halloween Happening festivities put on at the Northampton Township Parks & Recreation Center and special events at the Northampton Township Senior Center. As Lions, they are especially dedicated to helping preserve healthy vision and hearing, as well as helping our community. The results of their various fundraising projects have included contributions to the Bucks County Association for the Blind, Overbrook School For The Blind, Beacon Lodge (a camp for the vision and physically impaired), Leader Dog, Eye Bank of Delaware Valley, Lions Club International Fund, Volunteer Optometric Services to Humanity, Habitat for Humanity, Free Library of Northampton, Council Rock High School South Scholarship Awards, Churchville Nature Center, Courier Times Holiday Fund and others. One Lions project is Collection and Recycling of Used Eyeglasses. Easily recognized yellow eyeglasses collection boxes are located around the township. Glasses are collected from the boxes monthly, and go to a processing center near Trenton, NJ before being taken by medical teams to Central American countries and fitted to needy people for reuse. Another project the Lions will be undertaking is the examination of young (preschool) children’s eyes using an optical scanner that will tell whether a child needs vision correction or not. The Lions established the “Northampton Township Lions Foundation” which is a 501(c)3 organization, thus allowing tax-deductible donations possible to help them support their charities. They meet the first Tuesday of every month 6:30pm at a local restaurant. Visitors are welcome. See their webpage at www.nhtlions.org, or call PDG Lion Estella Kristiniak (membership chairwoman) at 215-757-6442.